Does art need an audience? 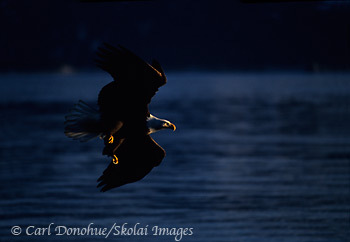 Backlit Bald Eagle, splashed with light, Homer, Alaska. Please click on the image above to view a larger version of this photo. If a tree falls in the forest? We’re all familiar with the old adage, and I think it’s an interesting question pertaining to art. If a musician, for example, doesn’t play music for an external audience, is s/he really a musician? Must a photograph have an audience? In my opinion, the answer is a resounding no. Art is something creating. Art is the pursuit of idea. That process of making some thing is the essence of art. Playing my guitar in my room, alone at night in the dark, can be every bit as artful as a performance on any stage. Sitting outside the little Shack in the winter woods, alone but for the forest and the great night sky, gently playing my Native American Flute is art. Lifting my camera to the eye, reaching through the viewfinder for my composition, bringing together the elements I see, crafting an image, is art. Whether the end product of that art reaches an audience is secondary; all too often that’s something over which I have little or no agency. Art needs no audience. Art needs artists; people who make art. That is the gift art brings our lives. What do we give in return? 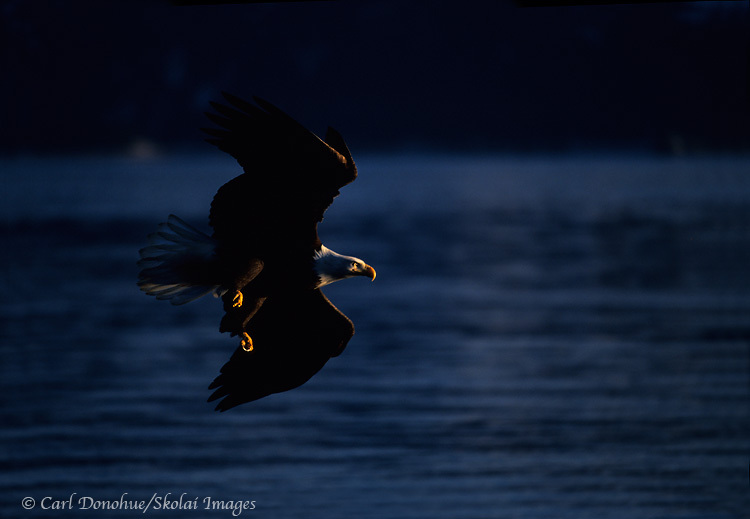 This entry was posted in Alaska, Art, Birds, Musings, Photography, Wildlife and tagged Art, Bald eagles on April 7, 2011 by Carl D.
This is a fantastic set of ideas, Carl, and a nice thought. Ron’s comment holds some merit, though. If your art brings *you* happiness, that’s all that matters. Then again, on the flip side, with no audience at all, your photographs are just pixels on a screen. The more imaginations, dreams and minds they’re exposed to, the more those pixels come to life. In that sense, one could argue the opposite of your thesis–art absolutely needs an audience. A very interesting question to chew on for sure. Initially, as I was reading I thought, of course not, art can certainly exist for its own merits without requiring someone to see it. But Greg’s comment above definitely connected with me. Art in and of itself is merely pixels on a screen, paint on a canvas, or waves of pressure moving through the air. What makes art truly art is sharing a connection or emotion with an audience — so I think I’m in the camp of yes, art needs an audience, but its perfectly fine if the audience is only the artist! Call me a snob, but I think there is a critical delineation between artist and audience, between playing and spectating. The audience are, essentially, spectators. The game of art is played on the field, and that game takes place, yes, even in empty stadiums. Does the game change with a screaming crowd? Sure it can, in various different ways. Energy levels build, adrenalin rushes, certainly. Playing music can certainly be very different in front of an audience. So without imagination (i.e. an audience), there is no art? Ahhh .. close, but no cigar .. an image on a screen might stir the imagination of a viewer. That’s something art can do. But that’s not what art is. My car can travel and carry me many thousands of miles .. but it’s still every bit a car sitting in the garage. Art doesn’t need people; people need art. It can be a very dysfunctional relationship at times. Great post Carl. I agree, art needs no audience to be geniune. In fact, some of the best art is that which is stumbled upon unexpectedly, and which isn’t seeking an audience. Point taken, Carl. However, being difficult, I’m going to make one last attempt to convince you of my point. Art does need an audience, because art is the construct of all those billions of neurons firing in each of our brains; it is a product of our biology. Thanks for stirring the water a bit, Carl…this is a great discussion! Well, you can make art for your own relaxation. As a mean to discover one self. I’m an old, procrastinating photographer. Single. I lack the compulsion to create that blesses/afflicts many of the greats. Frequently I feel frozen because there is no audience, no viewer, no critic. No echo of human energy coming back to me. Does a comic need laughter? Picasso had naked babes running around. That’s an ok audience. He probably still would have cranked out masterpieces without the babes. How many of us could paint anything with naked babes running around?